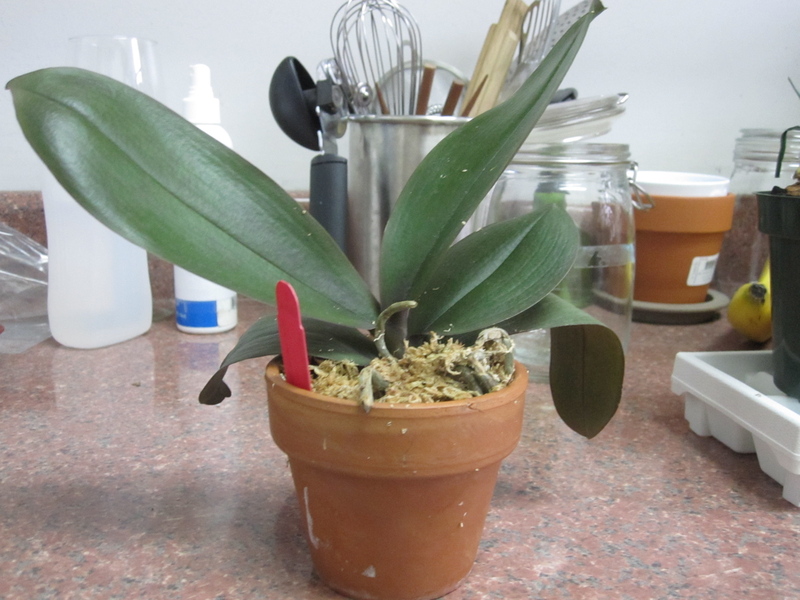 I have a couple more Phals that are not looking very happy, so in another rescue attempt I repotted them this morning. I’m not sure what that brown speckling is on the base of the crown but it’s been there for quite awhile and hasn’t spread, so I’m guessing it’s not a problem. But, let’s forget about that and talk about the more important element. Look at the new root growth! I’m excited because this poor orchid has been looking really sad for some time, probably at least three or four months now. So. Being that this orchid is finally starting to turn around after I repotted it in spaghnum moss (not packed too tightly), I decided it was time to switch out the potting medium for my other two sad orchids. I’ve had the first of these other two sad Phals for months, since late last summer or early fall (a Trader Joe’s purchase). It was doing quite well and even rebloomed for me, but has started to go downhill rather quickly as of late. 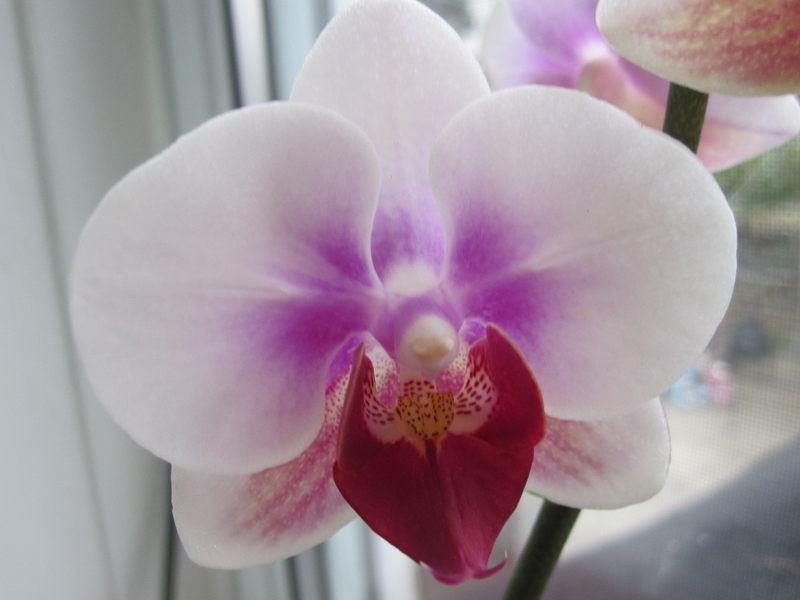 I think its downturn is partly due to my leaving the orchid in its original medium for months and months after I brought it home. The plant came packed SUPER tightly in sphagnum moss, which probably caused some of the roots to rot. The outward indicator of this was that a couple of the leaves began to wilt; one of them turned yellow and shriveled up. You might think that the pot looks too small for the plant. I chose to go with a smaller pot because the root system has degraded so much that its original pot seemed too large. 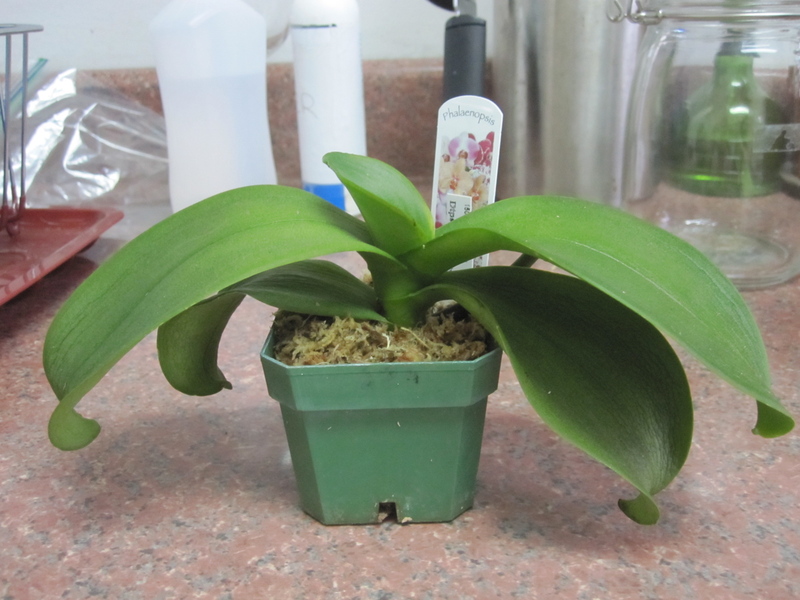 The second sad orchid is one of the Phals I received from Hausermann’s: the Laurel Blau. This one has a lot of aerial roots and was potted in a bark mixture; a couple of its leaves are starting to go limp. 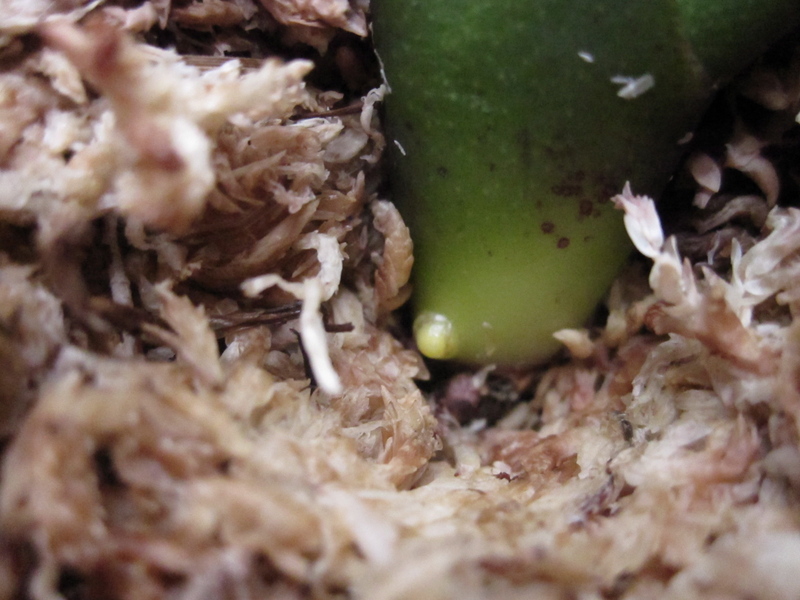 The orchid has a good existing root system plus a new root or two starting to sprout so it’s not in completely hopeless shape, but I still figured it might do better potted in moss to better retain moisture. When repotting this plant, I did my best to get the aerial roots inside the pot so that they don’t dry out so quickly, and I think I did a pretty decent job. As Liz Lemon would say: Blerg. I’m keeping my fingers crossed that these changes help improve my orchids’ health. As they progress I’ll be sure to keep you filled in. 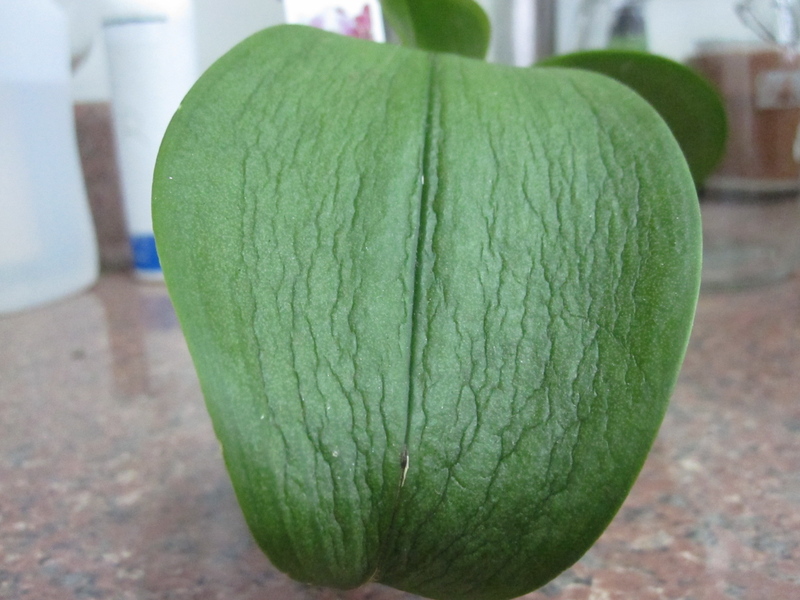 I love processing and sharing my orchid growing successes and failures here; it’s the perfect way for me to spread knowledge gained from my own experience! Hi, Your leaves of green leather have been overwatered at some point. 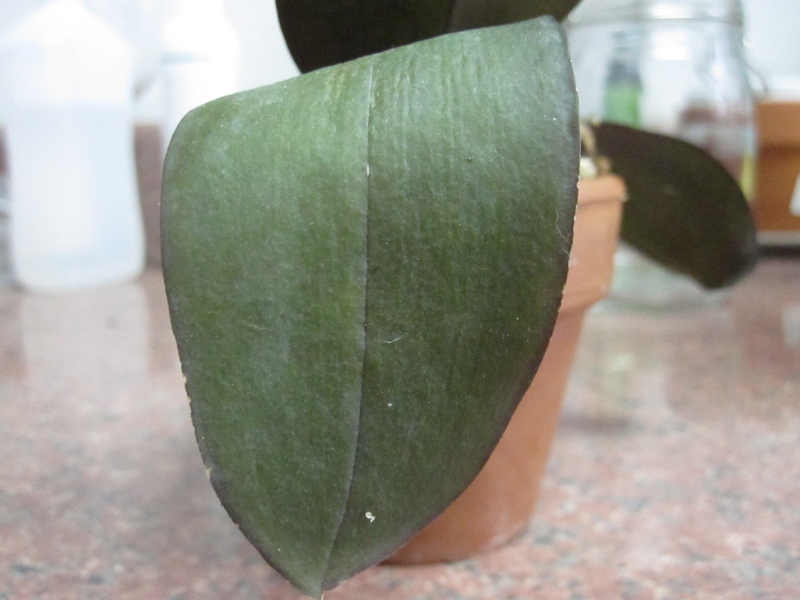 Too much TLC kills more phals than anything else, clear pots are essential and dont water while there is condensation inside the pots, ie let them dry out each time before rewatering.